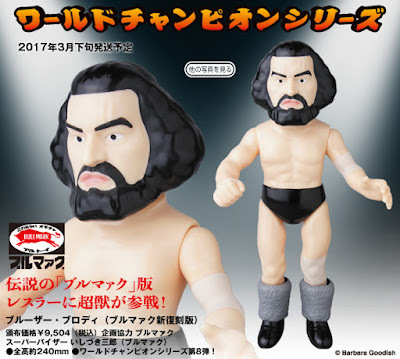 Medicom continues its popular line of Sofubi Fighting Series vinyl figures, which features some of the biggest names in professional wrestling, with this Bullmark Edition Bruiser Brody! This is actually the second colorway of the Giant Baba that Medicom has released. Along with a slightly different paint application on the figure’s body, it also sports an entirely new head sculpt! To The Blot, this version of Bruiser Brody looks a lot more like the legendary grappler than Medicom’s original release. The Bullmark Edition Bruiser Brody Sofubi Fighting Series Vinyl Figure by Medicom stands approximately 9.8” tall, is cast in soft Japanese vinyl with 3 points of articulation, and is sold individually for around $115.